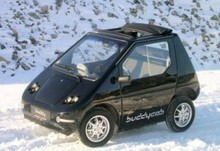 Buddy is produced by ElBil Norge AS which in 2003 changed its name from Kollega Bil AS. The company was originally established in 1992 and has been in the electric vehicle branch since that time. Managing director is Kjell Strøm. Elbil Norge AS is owned by the original founders Jan-Petter Skram and Viggo Vargum, in addition to external investors which include Hafslund Venture AS, Gezina AS (Tharald Brøvig), members of the Selvaag family, Lychegaarden (Jens P. Heyerdahl) og Jan Chr G Sundt. The owners have expanded the company gradually. In 2005, an emission NOK 12 million financed by the existing owners allowed for an expansion of the Økern factory. ElBil Norge had a profit in 2004 and 2005 and has a ratio of owner equity to debt of 90%.